the rest of the story: Doug is a second-generation American, born on the last day of February in Columbus, Ohio, amongst a typically Midwestern landscape of flat horizons and expansive skies. Hoekstra is a Dutch name â€“ Dougâ€™s fatherâ€™s father emigrated to Chicago from Marrum, Friesland; his motherâ€™s parents were also immigrants, crossing the pond from Lithuania. Hoekstra's parents met at a Northwestern University dance, just off Lake Shore Drive, in the blustery City of Chicago. Doug grew up in Naperville, Illinois, a suburb west of "the Hog Butcher to the World." Ensconced in this safe but closed community, it wasn't long before he hankered for "something more." He stumbled into his older brother's room one too many times and began listening to his pile of Beatles, Dylan, and Al Green records. Brother Dave also infected Doug with a lifelong passion for the lovable and hapless Chicago Cubs, appropriate training for the sometimes trying world of the music business! Hoekstra the guitarist/singer/songwriter, formed Bucket Number Six in 1990, a band that wound up recording two platters (Bucket Number Six, for Butch Vig's Madison-based Boat label, and the self-released High on the Hog). Bucket toured extensively through the Midwest, playing country music with an edge, citing influences such as Johnny Cash, Gram Parsons, and Hank Williams (peppering their original live sets with covers of all these artists). Among Bucket Number Six' Americana accomplishments: landing two songs in the National Baseball Hall of Fame (Hoekstra's "Only the Ball was White" and "Andy Pafko's Shoestring Catch"), an appearance at the annual Thomas Hart Benton Birthday Bash in Kansas City, and upon invitation, a recording session at the legendary Sun Studios in Memphis, which produced two songs for High on the Hog. 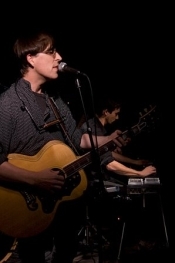 After Bucket spilled its final drop, Hoekstra began recording his first solo record, at various "hipster" Chicago studios stretching from Lincoln Park to Wicker Park. The sessions eventually came out in the form of When the Tubes Begin to Glow, Hoekstra's first solo CD, released in early 1994, after a move to Nashville, Tennessee. The musical journey continues with subsequent efforts Rickety Stairs (1996 Nashville Music Award Nominee for Best Folk Album of the Year), Make Me Believe (1999 U.S., 2000 Europe, earned 3 "first-phase" Grammy nominations), Around the Margins (2001 Independent Music Award finalist for Best Singer-Songwriter Album), and The Past is Never Past (2001 Europe-only odds & sods release). His latest and greatest, Waiting, was released in the U.S. 2003 on Paste Records, and in Europe in 2004 on U.K. imprint Fundamental.